The Newberry’s Creating Shakespeare exhibit offers visitors the rare oppor­tunity to view the books, artifacts, posters, and drawings that visually constitute the man and the canon that we know as William Shakespeare. Arranged chronologically so that the visitor takes a virtual walk through time, surrounded by the material objects that signify first the man and his career in his own time, then his presence in the subsequent centuries, and finally in our own cultural present, the exhibit purports to explain how he is both “of an age and for all time,” whatever Jonson’s famous poetic rendering might claim. The first gallery sets out to demonstrate Shakespeare’s situation within a broader theater industry, “of an age” in that he was one among many playwrights with whom he acted, collaborated, and competed. While no manuscript versions of Shakespeare’s promptbooks or plays are known to exist, the opening gallery features such items as a play manuscript by Ben Jonson and the diary of John Manningham, which gives a first-hand account of a performance of Twelfth Night as well as a (much-debated) account of Shakespeare’s sexual exploits. This first gallery imagines and presents the early modern London of which Shakespeare was but a part, emphasizing the world that created the man. After this initial gallery, the visitor continues into a room entirely devoted to the history of Shakespeare’s Hamlet in print, performance, and illustration. First-edition quartos, playbills, comic books, and sculptures all pay tribute to the historical constitution of what is probably Shakespeare’s best-known play. The Cranach Press illus­trated Hamlet, in particular, is a true privilege to view. The collection is impressive in its size and scope, to be sure. And yet, it is somewhat jarring in its devotion to one piece of work in an exhibit that seeks to situate Shakespeare in historical and cultural context rather than as a brilliant and solitary author who exists in a kind of timeless continuum. For example, an 1830 playbill included in the Hamlet collection also advertises performances of Macbeth and Julius Caesar later in the same week, which the exhibit passes over in its description of the artifact. Similarly, a small display on Sir John Falstaff tells the visitor that he has the second most lines of any Shakespeare character and appears in three plays, and that his likeness has been used throughout history for both artistic and political purposes, and yet he is afforded a single half-wall while Hamlet has an entire room. Ira Aldridge, who made a career for himself as a black man on the London stage in the early nineteenth century, most famously in Othello, which the exhibit informs the visitor was “one of the most performed plays since the Restoration,” is paradoxically given a single wall panel, while David Garrick’s Romeo and Juliet, “performed more than any other play during the eighteenth century,” is similarly given a single panel. The issue raised by a gallery entirely devoted to Hamlet is that Hamlet is the play which theatergoers and Newberry visitors alike can almost universally name when they think of Shakespeare. Hamlet, that work of psychological genius, is nearly synonymous with the notion of Shakespeare as solitary and eternal artist which the exhibit claims to eschew in its opening statement. It strikes one as a bit disingenuous to establish Shakespeare as “of an age,” a collaborator in a rich and thriving theater industry, in the first gallery, and then immediately reinforce the commonly held notion that he was exceptional in this second gallery. It is true that Hamlet has had a long and prosperous life on stage and page, but so have many, many more of Shakespeare’s works, as the Newberry itself concedes in other places throughout the exhibit. The dichotomy between intentional author and social collaborator has been a polemical one in academia for at least the last century or so, and it is therefore a bit disconcerting how the exhibit straddles the fence on this issue. However, across the lobby, the exhibit returns the visitor to the spirit of Shakespeare’s work as continually reconstituted and re-appropriated, even as it was in his own time. The final gallery brings the visitor into the late nineteenth and twentieth century, emphasizing the all-important performance and visual aspects of Shakespeare’s art. The gallery is bursting with color, featuring theater posters, advertisements, and even the actual costume worn by Edwin Booth in his portrayal of Iago, fitted on a mannequin. 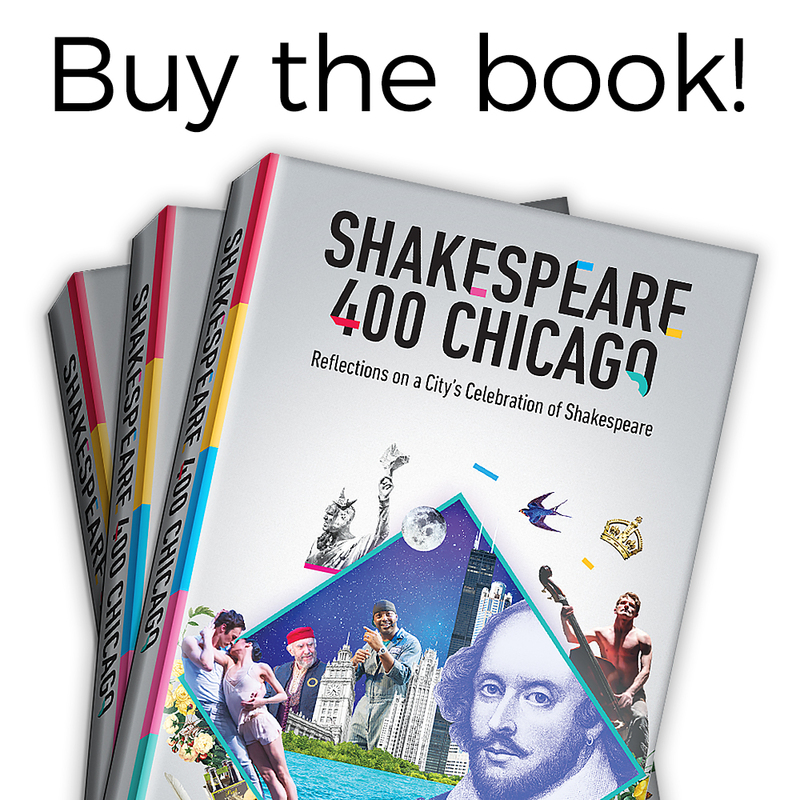 There are editions of mid-twentieth century comic book versions of plays, aimed at a young male audience, musical scores for operas and adaptations of various works, paintings, a beautifully gilded illustrated edition of A Midsummer Night’s Dream, and even Chicago Shakespeare Theater’s own recipe for stage blood. The emphasis is all on visualizing Shakespeare and the life of his works in the modern theater, and it succeeds in demonstrating the scale and value of the spectacle. But does this modernized Shakespeare come at a cost? What is lost when we begin to commercialize the Bard? If the nineteenth- and twentieth-century attempts to re-appropriate Shakespeare seem to have one common goal, it is to make money using his image and his creations. Some of the artifacts the visitor encounters do so explicitly; a Budweiser advertisement from 1908 features Shakespeare’s portrait, and another ad tells us that the 1949 Ford is “a midsummer night’s dream!” But there is also the more implicit sense that the avant garde stagings, the illustrated books, and the operas and musical versions of his plays have the true purpose of boosting ticket sales and actors’ careers, rather than any real commitment to artistic expression. It is a fine line, but what is most apparent is the burgeoning of the “Shakespeare industrial complex,” the notion that our modern culture both constitutes and capitalizes on Shakespeare and his works even as it holds him up as an artistic genius. But is there anything inherently wrong with this? As long as we acknowledge that we are appropriating Shakespeare for both artistic and commercial reasons, rather than hiding behind abstract or academic pretensions, perhaps this kind of cultural capitalization of the Bard is truer to his memory than anything else. It is, after all, how Shakespeare approached his own work. The Newberry’s exhibit thus takes the visitor full-circle, back to the emerging theater industry of sixteenth-century London. The creating Shakespeare, that is, the man who created the plays, in his coupling of artistic and economic goals, was not so different from the industry that is perpetually creating him. In this sense, the exhibit captures both the material remnants and the profit-driven, artistically inspired essence of the man and his works, four hundred years later. Anna Ullmann is a doctoral candidate at Loyola University Chicago specializing in Shakespeare and non-Shakespearean early modern drama, early modern historiography, and Marxist literary theory. She received an MA in English literature from Loyola University Chicago and her BA in English and sociology from Kalamazoo College.